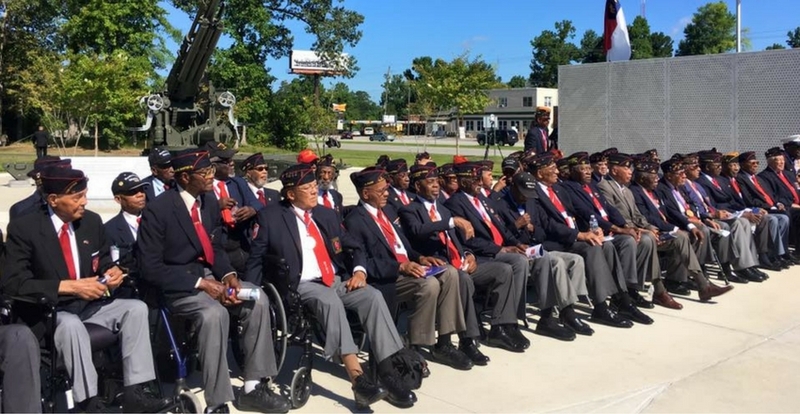 The Montford Point Marines Memorial is dedicated to the legacy of nearly 20,000 African-Americans who served in the Marine Corps from 1942 - 1949, but trained in a segregated training facility know as Montford Point Camp, Jacksonville, NC. The memorial tells the story through architecture and sculpture. 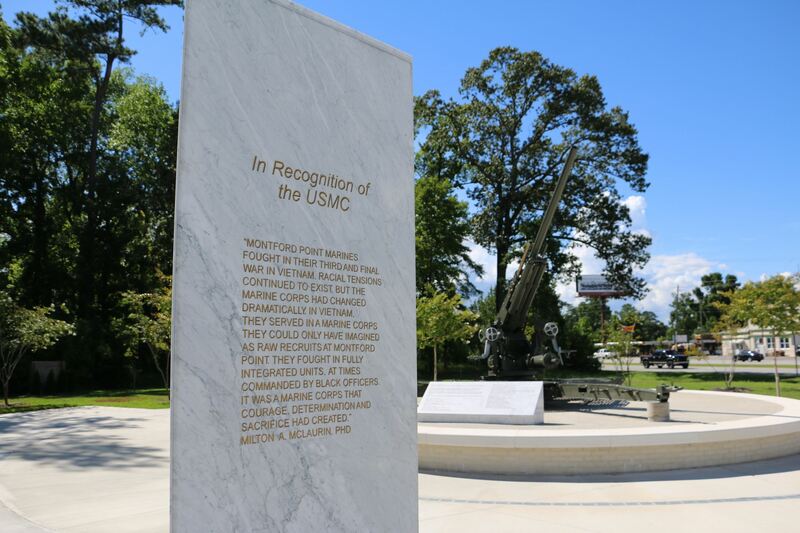 The memorial is located within the LeJeune Memorial Gardens in Jacksonville, NC. On July 29, 2016, the Dedication Ceremony held on the memorial marked the completion of Phase I of the memorial. The NMPMA® announced during the convention held that year that their fundraising goal of $1.8M were met with the assistance of the State of North Carolina. On July 25, 2018, a gifting ceremony, which marked the completion of the memorial, formally transferred the memorial from the NMPMA® to the Department of the Navy. Lt.Gen. Robert F. Hedelund, Commending General, II Marine Expeditionary Force participated in the ceremony. Three concentric circle patterns represent the ripples of influence that changes a nation. 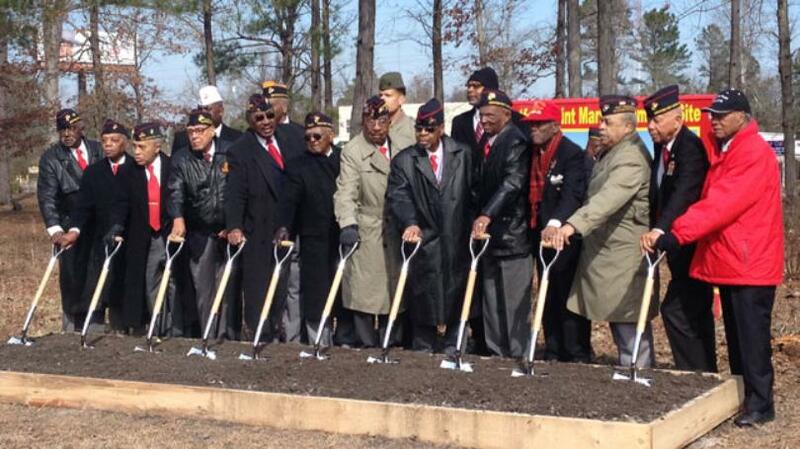 These ripples were caused by the Montford Point Marines, the U.S. Marine Corps and the American public. 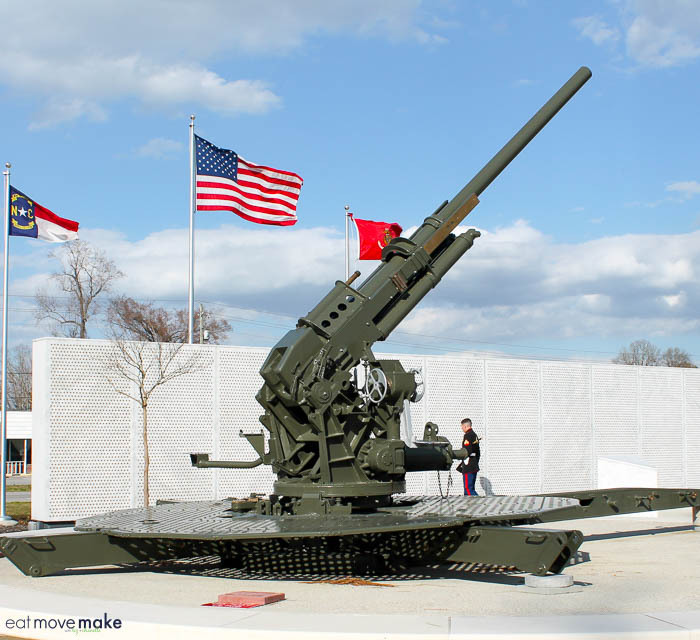 The M1A1-90 mm Anti-Aircraft Gun, was the standard anti-aircraft artillery for defense battalions in the U.S. Marine Corps during WWII and it is a weapon most associated with the Montford Point Marines. They Arrived… In 1942, after President Franklin D Roosevelt signed Executive Order 8802 prohibiting racial discrimination in the National Defense industry. They Served… In the bloody wars of WWII, Korean and Vietnam. They Lived… As sterling examples of integrity and service, in spite of the racial injustices they endured. 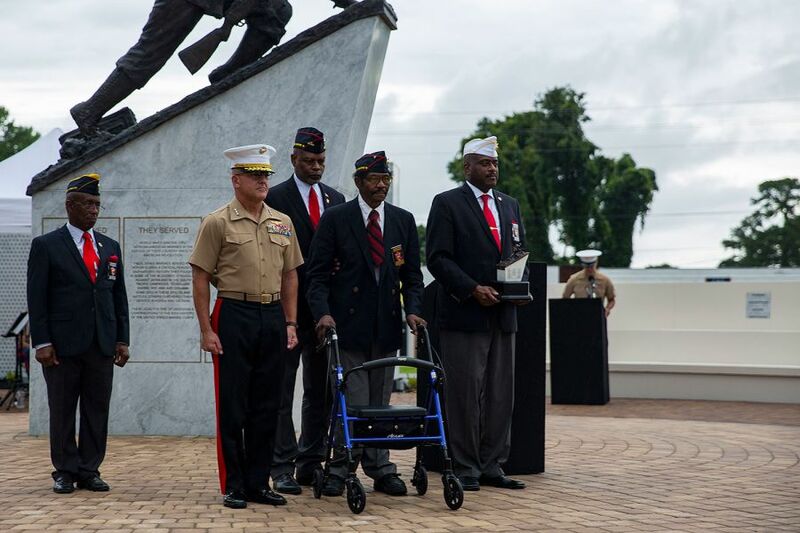 On the back side of the pedestal is the theaters of war where the Montford Point Marines served during WWII. 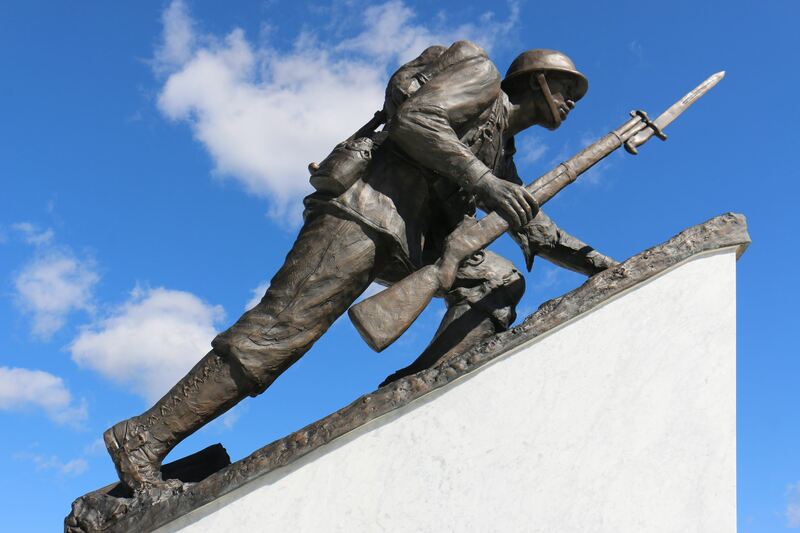 The raised bronze statue represents the Montford Point Marines; the angle of incline represents the uphill struggle for equality they overcame. The Marine is moving forward, armed with a rifle…his ammo can is behind him signifying the Montford Point Marines’ transition to infantry men from their assigned duties as ammunition suppliers and other support roles. 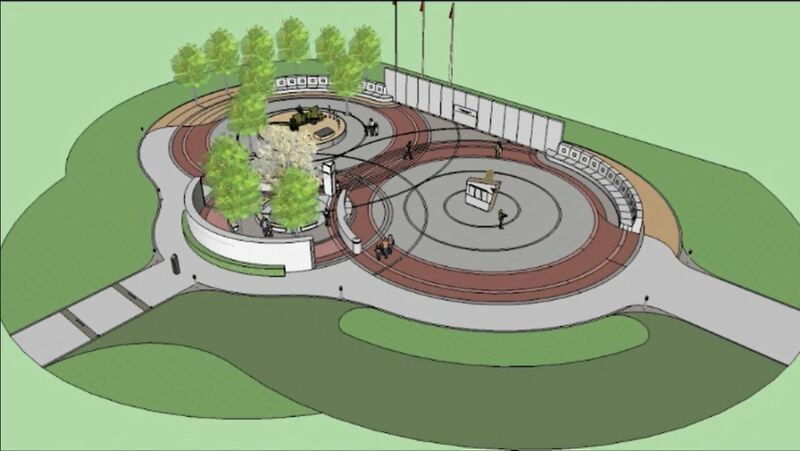 The Pillar of Collective Recognition stands at the nexus of the three concentric circles that comprise the Montford Point Marine Memorial. It honors Montford Pointers, the US Marine Corps and society during this time, for their unending drive to overcome equality.